It is quite common to see breeders and pet owners alike admiring and gushing about the Goldendoodle for its visible traits, such as its friendliness or its thick, beautiful, and low-shedding coat. Indeed, the Goldendoodle owes much of its success to these favourable traits. While that’s all well and good, there’s an equally important but least talked about aspect of our beloved Goldendoodle. Those are the health issues common to Goldendoodles. Although it’s impossible to eliminate every health condition or disease, it’s a good practice to check the health clearances of both the parents of the puppy you’re looking to buy. A good breeder should offer health clearances – proof that a dog has been tested for and cleared of a certain health condition – from in independent agency such as the Orthopedic Foundation for Animals or the Canine Eye Registration Foundation. Below are some of the diseases and conditions documented in Goldendoodles. 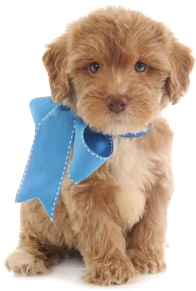 Keep in mind that not all Goldendoodles will get any or all of these diseases. Addison’s disease, or Hypoadrenocorticism, results from a deficiency in the production of adrenal gland hormones (either or both mineralocorticoids and glucocorticoids) among dogs. Signs to watch out for include poor appetite, weakness, weight loss, blood in feces,vomiting, diarrhea, and low body temperature. Allergic dermatitis, or Atopy, is an inflammatory, chronic skin disease that is caused by an allergy to substances in the environment. Symptoms include itching, scratching, hair loss, greasy or flaky skin with a foul odor. Cataract is an opacity in the lens of a dog’s eye that affects vision. Elbow Dysplasia is a degenerative disease that refers to the abnormal development of certain parts of a dog’s elbow joint during its growth. Symptoms may include diminished range of motion, morning stiffness, pain when extending or flexing the elbow, tendency to hold the affected limb away from the body, intermittent or persistent lameness, and fluid build-up in the joint. Gastric Dilatation-Volvulus, commonly referred to as gastric torsion or bloat, is a life-threatening disease in which the dog’s stomach dilates and then twists. The dog is unable to rid itself of the excess air in the stomach, and the return of blood is impeded causing the dog to go into shock. Signs include a swollen abdomen, excessively salivating, restless pacing, and retching without throwing up. Hip Dysplasia is a degenerative hip disease in which the ball and socket joint doesn’t develop properly. This may result in lameness on one or both rear legs and arthritis over time. Progressive Retinal Atrophy, also known as Progressive Retinal Degeneration or PRD, is to a group of inherited eye diseases characterized by the gradual deterioration of the retina. There is not treatment, and it affects both eyes at the same time. The dog goes completely blind over time. Von Willebrand’s Disease is a hereditary blood disorder that affects the clotting process. Caused by a deficiency of von Willebrand Factor, a blood glycoprotein involved in hemostasis, symptoms include nosebleeds, bleeding gums, occasional blood in the stool, prolonged bleeding from surgery, injury, or after whelping.